Postprandial lipaemia (PPL), an independent risk factor for cardiovascular disease, is affected by composition and timing of meals. 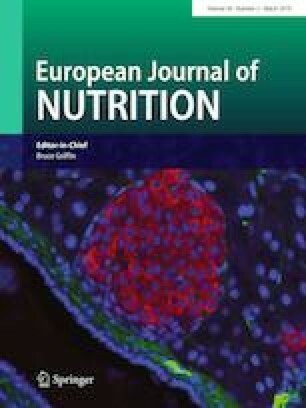 We evaluated if whey proteins (WP) consumed as a pre-meal before a fat-rich meal reduce postprandial triglyceride (TG) and apolipoprotein B-48 (ApoB-48) responses in subjects with the metabolic syndrome (MeS). An acute, randomised, cross-over trial was conducted. 20 subjects with MeS consumed a pre-meal of 0, 10 or 20 g WP 15 min prior to a fat-rich meal. The responses of TG and ApoB-48 were assessed. We also analysed postprandial responses of free fatty acids (FFA), glucose, insulin, glucagon, glucagon-like peptide 1 (GLP-1), glucose-dependent insulinotropic peptide (GIP) and paracetamol (reflecting gastric emptying rates). WP pre-meal did not alter the TG or ApoB-48 responses. In contrast, the insulin response was more pronounced after a pre-meal of 20 g WP than with 10 g WP (P = 0.0005) and placebo (P < 0.0001). Likewise, the postprandial glucagon response was greater with a pre-meal of 20 g WP than with 10 g WP (P < 0.0001) and 0 g WP (P < 0.0001). A pre-meal with 20 g of WP generated lower glucose (P = 0.0148) and S-paracetamol responses (P = 0.0003) and a higher GLP-1 response (P = 0.0086) than placebo. However, the pre-meal did not influence responses of GIP, FFA or appetite assessed by a Visual Analog Scale. Consumption of a WP pre-meal prior to a fat-rich meal did not affect TG and chylomicron responses. In contrast, the WP pre-meal stimulates insulin and glucagon secretion and reduces blood glucose as expected, and delays gastric emptying. Consequently, our study points to a differential impact of a WP pre-meal on lipid and glucose metabolism to a fat-rich meal in subjects with MeS. The online version of this article ( https://doi.org/10.1007/s00394-018-1684-3) contains supplementary material, which is available to authorized users. We thank Eva Mølgaard Jensen Lene Trudsø Jensen and Lene Bruss Albæk for outstanding technical assistance. Furthermore, we would like thank Anne Marie Kruse, Peter Reiter, Mette Bohl, and Anne Grethe Schioldan for assistance during the meal tests. This work was supported by grants from The Danish Dairy Research Foundation, Arla Foods Ingredients Group P/S, and Innovation Fund Denmark—MERITS (4105-00002B). AB was supported by research grants from The Danish Diabetes Academy supported by the Novo Nordisk Foundation, Aarhus University and The Research Foundation of the Department of Endocrinology and Internal Medicine, Aarhus University Hospital. Protein powder was kindly provided by Arla Foods Ingredients Group P/S. Ann Bjørnshave, Jens Juul Holst and Kjeld Hermansen have no conflicts of interest and other funding disclosures to declare.